Vegetation cannot completely surround the meter boxes and backflow prevention devices. Vegetation shall not hinder access to meter boxes and backflow prevention devices. 2.5 ft., or 30 inches, of clearance should be provided around the meter box and backflow prevention device. 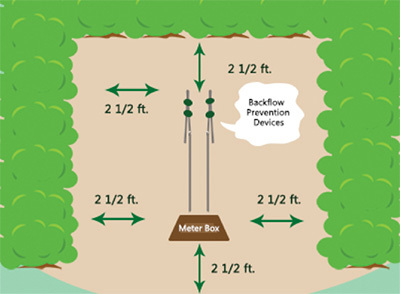 The illustration on the left shows the acceptable landscaping plans for meter box and backflow prevention devices. These clearances prevent delays in finding and using fire hydrants and fire protection equipment. The Florida Fire Prevention Code Fifth Edition has set standards for accessibility to fire hydrants. 18.5.3 Clear Space Around Hydrant. A 36 inch clear space shall be maintained around the circumference of fire hydrant except as otherwise required or approved. Bushes, Trees, Vegetation, Fences, Walls, etc. surrounding fire hydrants & post hydrants interfere with fire department & utility access. Please do not put obstructions in front preventing the hydrant from being visible from the street. Why is it important not to have obstructions around fire hydrants? When responding to a fire situation, our fire apparatus carry a limited supply of water. We rely on strategically located fire hydrants to supply us with the water we need to help with extinguishing a fire. To do our job more efficiently, we must be able to locate these fire hydrants quickly. Therefore, they must be clearly visible to us and unobstructed by vehicles, fences, or vegetation. The laws in our jurisdiction recognize this and address the issue. Can I paint the fire hydrant in front of my house? The short answer, no. The long answer, no. Fire hydrants are painted blue with white tops by the city so as to be easily seen, and readily recognized by the fire department as being active. Why does the Utility department keep telling me to move my fence or bushes around fire hydrant? Clearance around fire hydrants must have 36 inches on both sides of hydrant and in front and nothing blocking the hydrant from view: the hydrant must be visible to vehicle traffic for a minimum distance of fifty feet in either direction. If you receive a notice that you have a fence, plant or other obstructing item, you must take corrective action. If sufficient access in not provided we will make the necessary adjustment around the fire hydrant. If you are not sure of what actions need to be taken, contact the Utility Department. The fire hydrant in front of my house is ugly and I want to hide it, can I? The short answer, no. Based upon the Florida fire prevention code NFPA1, hiding a hydrant could be considered a violation. Simply putting up some kind of natural (plant) or artificial (fence) screening between your residence and the hydrant may be OK, as long as it maintains an adequate working radius around the hydrant, and does not block its view from the roadway and approaches. 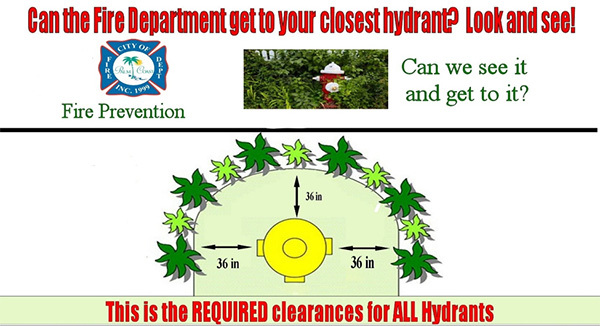 If you wish to do some landscaping, wall building, or fence construction near a hydrant, please contact the Utility Department first to see if it meets the proper clearance required. This could avert additional costs and concerns. What can I do as a resident of Palm Coast to help? You can help yourself, your neighbors, and your local firefighters by simply keeping an eye on the hydrant, trimming back/down any growth nearby, notifying the water department of any damage or maintenance issues, and ensuring that adequate clearances and proper visibility are maintained. If a hydrant cannot be found, it cannot be used. Please help us make them easy to find.